A basic understanding of how cameras work will help you take better pictures. This article will help you grasp the basic concept of how cameras capture the right amount of light and turn that light into a photo. It may not be exciting reading material, but take just a minute to see how they work and cameras become an easier tool to master. There are many, many different cameras and designs with different features and functions to choose from, but the basic way they work is the same. 1. The lens focuses the light onto the sensor. 3. The right amount of light hits the sensor. 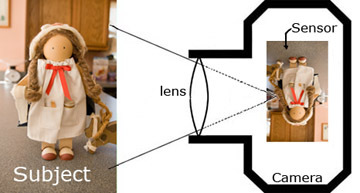 The amount of light that reaches the sensor is controlled by how long the shutter is open (the shutter speed) and how wide the opening (called the aperture) in the lens is. Think of it like a door or a window opening and shutting. A larger doorway (a bigger aperture) will let in more cold air into the room (the camera) than a tiny window. Also, if you leave the door or window open longer (like a slower shutter speed) you'll let in more cold air. The aperture is built within the lens just like the pupil in your eye. More on Aperture. The Shutter Speed. If the shutter speed is too slow or the shutter is open too long, your photo will be blurry or unsharp. This may be caused by the camera or your subject moving. If you have a very short exposure or a high shutter speed, your picture will be sharp even though your subject or the camera moved during the exposure. The Aperture. If the aperture or opening is small the range of things in focus is big. Things that are close to the camera AND things that are far from the camera will be in focus and sharp. If the lens aperture is wide open or large, the range of things in focus (called "depth of field") will be narrow or shallow. Here is the confusing part: A small number for the aperture, such as f2 or f4 means a big aperture(opening). A large aperture number such as f11 or f16 is actually a small opening or aperture. This is because these f numbers actually represent fractions. So, 1/2 (f2) is a bigger size than 1/16(f16). 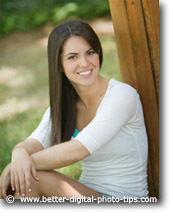 Narrow depth of field is use in portraits when we want the subject to be sharp and the background to be out of focus. In this portrait, I set my camera aperture to f2 and the camera automatically set the shutter speed. This small number means the lens was "wide open" and gave me the desired "narrow" depth of field. The background is pleasantly out of focus. 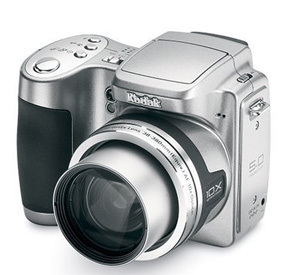 The auto exposure mechanism in the camera works by adjusting the shutter speed, aperture or both. How digital cameras work with the huge amounts of data is amazing. With digital photography, the camera will "process" the information with software and will be stored in the camera's memory. With film cameras, after the film was exposed to the light, the information had to be processed with chemicals to create either a negative or if it was "slide" film the process made it into a "positive"
The correct photo exposure is determined by how long (the shutter speed) and how wide open the lens opening is (the aperture). Most shutter speeds range from several seconds to as fast as 1/8000 of a second with some high-end DSLR cameras. Understanding how cameras work with respect to the ISO setting on your camera will also be helpful. With the automatic exposure system of the camera, the amount of light (how bright a scene is) and the sensitivity of the sensor (it's ISO setting) will effect what shutter speed and aperture the camera uses. High ISO settings like 400 or 800 means the sensor is more sensitive to light. That is to say, it doesn't need as much light for a good exposure. High ISO settings then are good for low light shooting situations or when you want a real fast shutter speed. Here is a video that does a great job of explaining how cameras work using aperture, shutter speed, and ISO. It's done by Tony Northrup, a well know photography educator. He does a great job of showing you, not just telling you. I like Tony's materials so much I recommend his Book on Digital Photography. At 14 minutes long, the video is long enough to give you great details by showing you the results of changing these 3 different camera settings and how they affect your pictures. It's interesting enough and short enough that you won't get bored. Photo exposure. For a more detailed explanation of how shutter speed, aperture and ISO settings all affect the exposure of your photograph read this article titled: Photo Exposure. Camera Buying Guide. If you are looking to buy a new digital camera, it will be worthwhile for you to read the Digital Camera Buying Guide first. Understanding how cameras work is good knowledge to have. If you can imagine the process of how photographs are created, you will be able to make better decisions on what camera settings to use.